“House As Trap” is a unique lost pet recovery technique that Missing Pet Partnership advises some pet owners to use to capture skittish dogs and cats. The concept is that when you have a skittish pet that bolts outside and then returns to the home but won’t allow you to approach and keeps darting away in fear whenever you open or approach the door, you can effect a capture by some creative thinking. 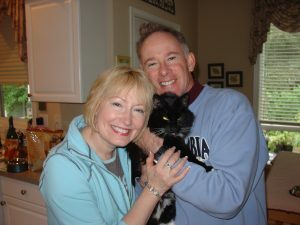 Leigh Scott and Jeff Foster from University Place, WA were panicked when their indoor-only cat, Ruffles, escaped outside. Ruffles had never been outdoors. His house backed up to a greenbelt that harbored coyotes. It was a very frightening experience to say the least. The couple immediately consulted with Missing Pet Partnership and rented a humane trap. But Ruffles did not enter the trap on the first night. And at 4:00 p.m. the next afternoon Jeff spotted a coyote standing in the backyard! MPP immediately advised Jeff to dump a small sack of dog food and large meaty bones (or large rawhide bones) in the spot where he saw the coyote. This technique (called “decoy food”) works well as a deterrent. Coyotes are scavengers and if you can fill their belly with food (free dog food) and give them a bone to haul off and gnaw on for several hours, then you mitigate the chances they will expend energy trying to catch and kill live prey (i.e. Ruffles!). Putting food out like that sounds risky, but in reality you will likely need food to attract and capture a displaced cat. So helping coyotes become satiated with an easy meal of dog food (while your cat is displaced) is much better than having them hungry and hanging around the area! Back to Ruffles. So late the next night, the other indoor-kitties began meowing at the backdoor. Jeff snuck down the stairs, shone a flashlight at the backdoor and saw Ruffles outisde on the back porch looking into the glass door! But as soon as he opened the back door, Ruffles bolted back into the woods! The next morning, Ruffles was not in the huamen trap but the dog food and meaty bones were gone (and so was the coyote). When Jeff called MPP to say that Ruffles had come to the backdoor during the night, we instructed him how to perform the House As Trap method (place a trail of food outside that leads inside, prop open the back door; sit behind it and slam it closed after the pet enters the house). The next night, Leigh and Jeff took turns and set up planned shifts for who would sit behind the open door. Leigh took the first shift. At approximately 11:00 p.m. while sitting behind the door reading her novel, Leigh heard crunching sounds. She looked up to see that Ruffles was inside the house! She closed the door and to her great relief “captured” Ruffles inside his own house. 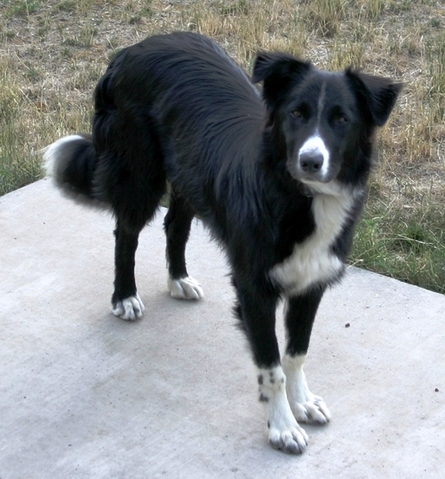 Missing Pet Partnership received a call from Tammy Dziak requesting help in recovering Ike, her brother’s (Steve) border collie. Steve and his wife Shawna lived in Yakima, WA. They came to Federal Way, WA so Steve could have surgery. Tammy watched Ike while Steve was in the hospital but the timid dog missed Steve so much that he launched over a fence and took off into the unfamiliar neighborhood. The following day, Ike returned to Tammy’s house and even entered the back door that Tammy had left open in case he came back. But when Tammy came downstairs, Ike bolted back out the door and vanished! Late the next night after the escape Ike actually came back inside Tammy’s house (she’d left the back door open). Howevr, when Tammy went downstairs, Ike bolted outside. 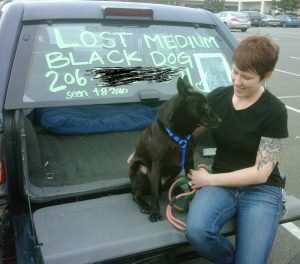 Tammy called Missing Pet Partnership and we activated our volunteers as seen in this King 5 news footage here. We tagged our cars, held an intersection alert, posted neon posters. We also set a baited humane dog trap in Tammy’s yard, hoping that Ike might return again. But the next day Ike was spotted 3 miles away on a busy roadway, running from would-be rescuers. We searched that area and posted signs along that roadway but the sightings stopped. Hope began to fade. Then, ten days after he had disappeared, Ike showed up on Tammy’s front porch at 3:00 a.m. (her dogs barked to alert her)! She tried to coax Ike but he bolted and ran. Remembering MPP’s advice to use her House As Trap, Tammy placed bait (chicken) on the front steps leading into her home, placed her cell phone inside of the house (with the speaker phone turned on), stood behind the front door, and had Shawna (on the phone, calling from Yakima, WA) call for Ike over the phone. It worked! Ike slowly crept into the house, Tammy slammed the door, and the skittish dog was reunited with Steve and Shawna just three hours later! The touching reunion (have tissue handy!) was captured on film here by King 5 News. On Thursday April 1st, just 12 days after we adopted our 2+ year old Taiwan dog, Vivian Irene, she ran off during a midnight pee break. I usually put her harness on but figured her collar and leash would be fine. But she got spooked, pulled out of the collar, and ran off! Instinctively, I chased after her but she was too fast and was gone by the time I crested the nearest hill. We looked for her everywhere but couldn’t find her. We came home and put up a Craigslist ad and created a flyer. I stayed up almost all night just worrying. Over the next 2 days we gathered our friends and canvassed our busy neighborhood; tacking up flyers and talking to anyone who would listen. We actually saw Vivian Irene several times following leads from phone calls but each time she would run the other direction. Once I chased her for over 3 miles, possibly the biggest mistakes I made in this whole search, but somehow she found her way back to our neighborhood! On Sunday morning I got a tip about the Missing Pet Partnership and Jim Branson called me that afternoon. Jim immediately assuaged my hysteria and we came up with a plan involving a humane trap and an infrared camera! The use of these tools seemed remarkable to me at the time but now just seem essential in the return of our dog. Throughout this experience, I struggled with the guilt and tremendous uncertainty of losing a pet. It was all my fault. Where could she be? Why didn’t she want to come home and be with us? Jim told me I couldn’t possibly be expected to know how to deal with finding a missing pet and that MPP would do everything they could to help me. I experienced such a great deal of comfort through these phone conversations and emails with Jim that I was able to stay hopeful and positive. 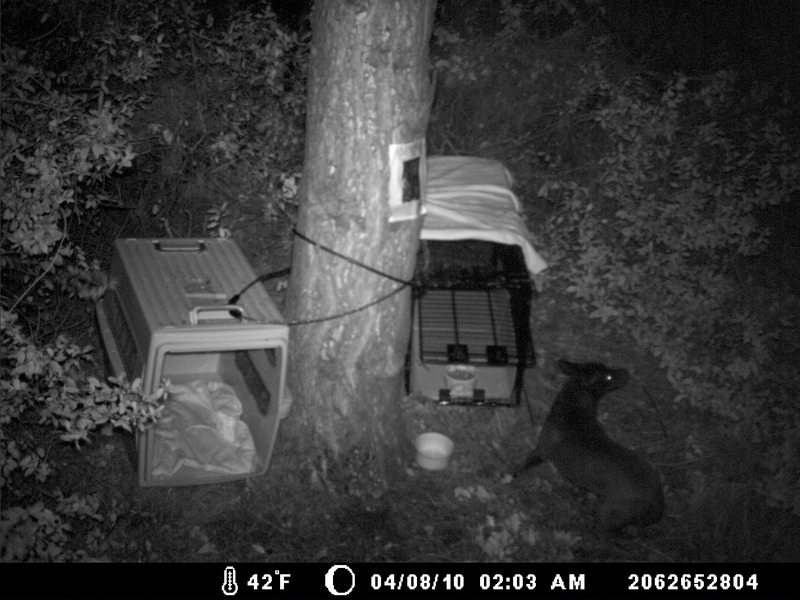 I set up the trap and camera Monday night and eagerly viewed the photos early Tuesday morning. Vivian Irene was in fact coming to the trap! Vivian Irene Checking out the Trap, but Not Going In! Over the next few days we got Vivian Irene closer to going into the trap but a malfunction with the camera and a day with no sightings in the area really got me down. At the same time, we were keeping a bed and a bowl of food on the porch of our apartment house. A phone call sighting and an empty bowl told us she was coming home to eat also! I met with Jim for a pep talk and to pick up yet another tool: a surveillance camera for the front porch. We knew we had a good chance of getting Vivian Irene home but with her trotting out and about in such a lively and heavily trafficked neighborhood, and people’s first instinct being to chase her, we worried that if we didn’t get her soon something terrible would happen. Since we had gotten calls saying she was near our house at breakfast time as well, I cooked some bacon and propped open both the doors leading to our house. No sign of her. Friday morning there was no photographic evidence of her at the trap but she did come to the house 2x to eat! But the next Friday as we watched from inside the house, Vivian Irene came up to the porch as many as 4 times! Jim made a special trip to check out our house and see if there was a way to trap her on the porch or lure her inside. We decided to wait to see if she came back to the trap or eat from the porch. Saturday night she ate food from just inside the trap and Sunday morning she took he bacon from the porch again. I decided to leave the doors open and move the food inside the house to encourage her to come all the way in. We rigged a string to the door knob so that I could pull the door shut without startling her if she did come inside. At about 12:50 I spotted her on the porch! She acted normally, taking bites of food from the bowl but running out to watch the street very cautiously. She ran down the steps and out to the street – then back up to the bowl again. I couldn’t see her anymore but I heard her enter the house…she was in the kitchen! I was afraid to look for fear of scaring her so I waited a moment more and then pulled the string! It came undone but there was enough momentum to shut the door completely! Vivian Irene was inside! We did it! A relief washed over me that I had never felt before! I immediately sent text messages to Jim and he was able to come over and finally meet Vivian. She was VERY shy, as we knew she would be, but within an hour she was asleep in my lap. Exhausted but content. I don’t know where to begin to thank Jim and the Missing Pet Partnership! Their knowledge, assistance and encouragement have been invaluable. If not for them, we would never have gotten Vivian Irene back home safe. My heart is overflowing with endless appreciation and PRAISE for the Missing Pet Partnership! MPP first started advising pet owners to use the House As Trap method to recover displaced, indoor-only cats that had escaped outdoors in cases by using electric garage doors. We advised cat owners to dribble droplets of canned cat food in their driveway leading all the way into the far end of their garage where they placed a plate of crunchy cat food. Next, they would place a baby monitor next to the plate of food, open their garage door about eight inches, and arm themselves with the remote control all night. If during they night they heard crunching noises on the baby monitor, they were to push the garage door opener, trapping the animal inside their garage, and pray to God that it was their panicked cat in the garage and not an angry skunk! House As Trap is a very effective method in cases where cats like Ruffles are reluctant to enter a humane trap. We’re equally delighted to see that it has proven to be an effective method in recovering skittish dogs like Ike and Vivian Irene!